Report: Feminine. Very good proportions. Excelent front and rear, excellent topline. Report: Very good proportions. Good head and good pigment. Good topline. Good front but needs to be stronger in hindquarters to have more drive. Moves and shows well. Result: 1. Exc New ChJunior Gibraltar! Result: 1. Exc, CCJ New ChJunior Portugal! Report: Cobby type. Two dark eyes. Pigment coming. Good stop. Well balanced head. Arched neck. Good rise over the loin. Good depth of brisket. Coat coming nicely. Moved well for age. Well handled and presented. Report: Typical. Very good proportions. Excellent head, very feminine. Good topline. Good chest. Excellent angulations. Correct movement. Report: Excellent type, correct topline, good head and expression. Very good angulations. A little close behind in movement, good side gait. Report: Feminine head and correct proportions. Nice neck, correct topline, correct angulations, correct coat, good temperament, good movement. Result: 1. Exc, CAC-QC, CACIB, BOB New Ch Portugal! Report: Love her, much my type, small feminine. Super outline. Everything to like, just needs a little more pigment around eyes. They are dark. Excellent bite. Super neck. Clean shoulder, excellent bone. Short backed. On the move she totally impress. Just in between in coat change, what she has is lovely. Top class, just love that action. Needs 6 months then will be hard to beat. Top class. Report: Good head and expression, good neck and topline, sufficient depth of brisket, good coat condition with good texture, moves well. Result: 1. Exc, R/CACIB, New GrCh Portugal! Result: 1. Exc, GCC, CACIB, BOB New Ch Gibraltar and New Ch. International! Report: 3 years, good bone and size. Nice head, good neck, good topline, croup too steep, excellent strong chest. Excellent angulations and nice movement . Result: 1. 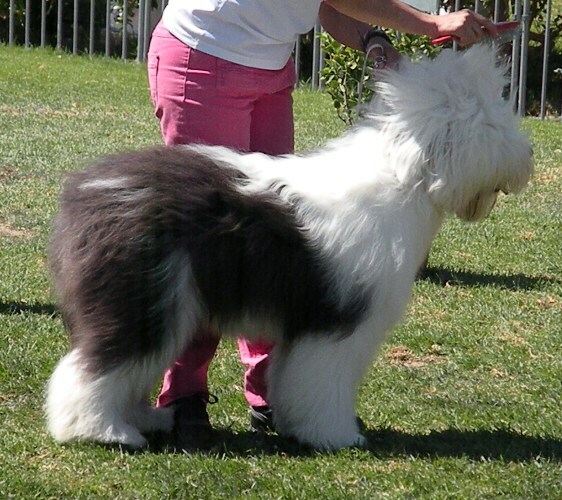 Exc, CAC, BOB, R/BIG New Ch Spain!